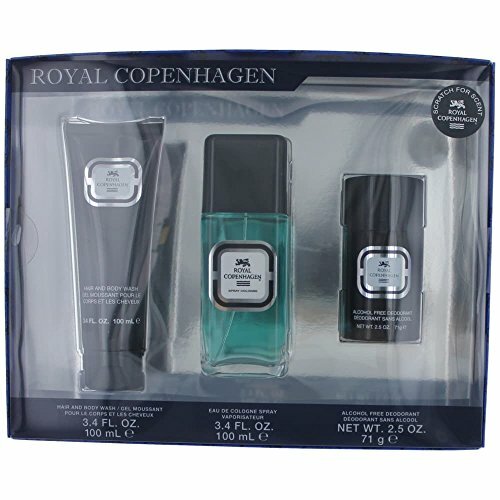 Royal Copenhagen for Men 3 Pc. Gift Set ( Eau De Cologne Spray 3.3 Oz + Hair & Body Wash 3.4 Oz + Deodorant Stick 2.5 Oz ) by Royal Copenhagen. Royal Copenhagon is an extravagant, splendid, majestic and magnificent masculine scent to impress and intoxicate women. It involves a refined, superior and completely distinguished flavor and aroma to sniff with good words and compliments from others. It is mainly composed of jasmine, amber, lemon, moss and orange with a touch of eastern, herbal and oriental tones.